1. How many princes did Darius set over his kingdom? Verse I. 2. How many presidents were placed over them, and who was among them? Verse 2. 3. Why was Daniel preferred above all the presidents and princes? Verse 3. 4. What did the king purpose to do? Verse 3. 5. “What did the presidents and princes then do? Verse 4. 6. Why could they find no occasion against him (concerning the kingdom)? Verse 4. 8. What decree did they request the king to issue? Verses 6-8. 9. What did the king do? Verse 9. 11. What did the leading men of the kingdom then do? Verse ll. 12. What did they say to the king? Verses 12, 13. 13. How did the king feel over the matter? Verse 14. 14. What did he do? Verse 14. 15. To what did Daniel’s enemies call the king’s attention? Verse 15. 16. What was done with Daniel? Verse 16. 17. What did the king say to him? Verse 16. 18. What was done to secure the mouth of the den? Verse 17. 19. How did the king spend the night? Verse 18. 20. What did he do very early in the morning? Verse 19. 21. How did he address Daniel? Verse 20. 22. What was Daniel’s reply? Verses 21, 22. 23. How did the king feel? Verse 23. 24. What command did he give concerning Daniel? Verse 24. 25. What was done with the men who accused Daniel? Verse 24. 26. Unto whom did King Darius write? Verse 25. 27. What decree did he make? • Verses 26, 27. 28. What is said of Daniel? Verse 28. 1. IT is the privilege of the children of God to have the same character that Daniel had, so that their enemies can find no accusation against them, except concerning the law of their God, or, in other words, in regard to their religious faith. Our course should be faultless “before the world, then our influence will tell most powerfully in. favor of the religion which we profess. If we do unto others as we would that others should do unto us, this will be the case. We will be kind, generous, forgiving, gentle, honest, and truthful. 2. DANIEL was not ashamed of his religion, neither was he afraid to have it known that he prayed to God, even when he risked his life by continuing his devotions, as was his custom. 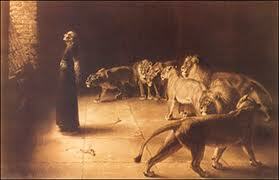 Daniel was not defiant in his attitude toward the king. He only prayed as aforetime. If he had begun this manner of praying after the decree was issued, he would have shown a defiant spirit, which is never proper for the Christian to manifest. The people of God should be loyal to Him, whether human laws are liberal or oppressive, whether they are framed in the interests of liberty and equality, or of a religious despotism. And, however unjust and oppressive, human laws should be obeyed by the Christian unless they conflict with the law of God or our duty to Him. To this rule there is no exception.